Join Steve Sheppard on One World Music Radio as he reads the album review he wrote for Shoshana Michel and her album Dancing on the Wind to a backdrop of music from the album. Anna Sutaygina of Moving Classics TV interviews Shoshana. You can read the interview here and watch Anna play my composition “When Leaves Dance” below. Sleepy Songs interviews Shoshana for their blog, Behind the Piano. Disctopia interviewd Shoshana about her views on today’s music industry and technology. Shoshana discusses playing ragtime music early in her career, her first album, and her One World Music Radio nomination for her latest album “Dancing on the Wind”. Join Chrissie Sheppard on One World Music Radio as she talks to Debut Artist Shoshana Michel about her career and what brought her to this point in her life where she has now released her debut album. “I am sitting here just listening to your music and it is so hauntingly beautiful, I just felt like I had to tell you that. I don’t usually listen to instrumental music but this is so meaningful. 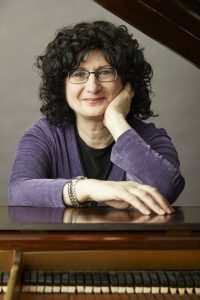 Thank you for sharing it with us.” – Chana G.
“Master pianist Shoshana Michel has created a lovely collection of classical piano arrangements based on Chassidic melodies (niggunim). Her playing is graceful and flowing and her tone is rich and resonant (thanks to her technique but also thanks to the high-quality recording and production). The total effect really does touch your soul. I love this CD and I have it in regular rotation for car rides, to relax and enjoy the drive, and to sing along with the familiar melodies with beautiful piano backing me up! It’s also a great mood-fixer for children. Everyone immediately takes a deep breath and feels calmer when I play it. Shoshana’s music would create the perfect atmosphere for a wedding reception (or other occasion). My daughter will actually be getting married in a few weeks and this is one of two CDs that we plan to use during quieter moments between live music sets. I’ve wanted a more “listenable” form of these niggunim for years. They should feel meditative and uplifting. These piano renditions are very easy on the ears, and for me, listening to them makes me feel transported to a soulful place, as niggunim should do.